New product development (NPD) requires creative thinking and tackling new challenges, both of which make it difficult to determine tasks and timing in detail at the outset. There are real benefits to planning, tracking and measuring NPD, but you need tools that are flexible enough to meet these challenges. What is the current product spec? Are marketing and engineering on the same page? Are any team members stuck waiting for anything? Do we need to conduct research or get further information at this point? What kinds of questions/issues are being raised by team members? Project.net will also provide you with structured, reliable information you can use to keep your management up-to-date as well as keep an up-to-date product specification that everyone can reference. Project.net provides everything your teams need to clearly communicate and document their progress, all while keeping in sync with the overall project. You track progress not just with time logs, but through submitted work supplemented with associated blog and wiki entries that team members provide as background information about what they've completed. Collaboration is maximized: just as in a stand-alone blog or wiki, others can comment, enhance, or just simply follow the entries: you can do the same with others' entries. As the project progresses, a rich data set of enhanced data – the blog and wiki entries – is being created in parallel with (and associated with) the traditional project management data. 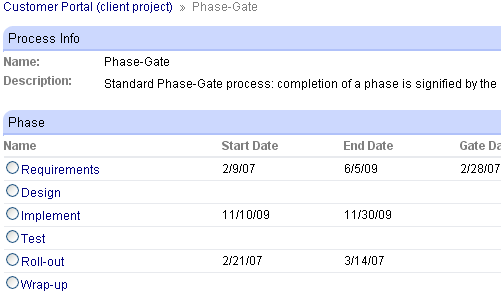 Define your project’s phases. You construct each phase, the sequence of those phases and define the deliverables due upon phase completion. Create document templates for key deliverables. Creating document templates will get team members on the same page with respect to the documents that will need to be created to support product development. These can and should change, but a starting point will provide valuable focus. Introduce your team members to their personal dashboard, which provides easy access to their assigned tasks and progress as well as the project dashboard. Make sure they are comfortable with tools and are committed to logging their time and progress. Enjoy the unparalleled visibility offered by Project.net.You can drill down with the finest levels of granularity into the current state of the project and understand how it got there. You can generate reports for yourself and your management to guide the project to successful completion. Project.net's a full Project Portfolio Management solution, so it can be used to manage the development of many different products, as well as the overall product development pipeline.